Use firm bananas and cut into 1 inch sections. Leave the peel on for easy handling, and with a melon baller, dig a well in the middle of each banana section. Melt chocolate in the microwave and dip the bottom portion of the banana in chocolate and then dip it once again in either non-pareils or chopped peanuts. 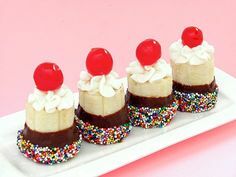 To quickly harden the chocolate, place dipped bananas in the freezer for five minutes. Fill each well with ice cream and top with whip cream and a maraschino cherry.